Elizabeth Meyer's "sweet, touching, and funny" (Booklist) memoir reads as if "Carrie Bradshaw worked in a funeral home a la Six Feet Under" (Publishers Weekly, starred review). 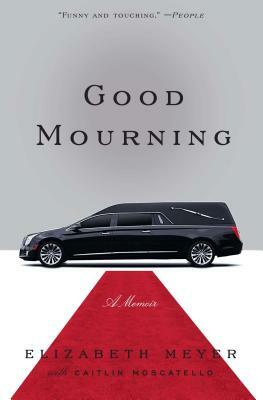 Good Mourning offers a behind-the-scenes look at a legendary funeral chapel on New York City's Upper East Side--mixing big money, society drama, and the universal experience of grieving--told from the unique perspective of a fashionista turned funeral planner. Meyer has seen it all: two women who found out their deceased husband (yes, singular) was living a double life, a famous corpse with a missing brain, and funerals that cost more than most weddings. By turns illuminating, emotional, and darkly humorous, Good Mourning is a lesson in how the human heart grieves and grows--whether you're wearing this season's couture or drug-store flip-flops. Elizabeth Meyer became passionate about making death a less taboo and scary topic. She holds a bachelor of arts from New York University's Gallatin School, an MBA from Cass Business School in London, a certification in thanatology from the Association for Death Education and Counseling, and is a licensed funeral director. Elizabeth regularly contributes to news articles, speaks on nationally syndicated radio programs, and has given guest lectures about death and dying. Currently, she advises private clients and consults for a website that deals with end-of-life issues. Elizabeth was raised and currently resides in New York City. Caitlin Moscatello is a writer and editor, whose work has appeared in "Glamour," "Marie Claire," "O, The Oprah Magazine," "SELF," "Redbook," "Fast Company," "Sports Illustrated," and other publications. She lives in Manhattan.